The implant, Probuphine, is placed in the upper arm. It releases a steady dose of buprenorphine for six months, HealthDay reports. 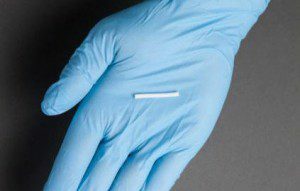 Researchers found 86 percent of patients with a Probuphine implant were still drug-free after six months, compared with 72 percent of those who took the pill form of buprenorphine. The results appear in the Journal of the American Medical Association.